Fiddleheads are the taste of spring and may be the first wild green you can harvest as winter melts away. Fiddleheads Ferns grow on the edge of streams and river in shady spots. They are a coveted delicacy and fiddlehead patches are secretly guarded by foragers who strive to assure their supply year after year. This year I was welcomed into the world of fiddleheading. Having never tasted let alone picked a fiddlehead before, I was in for an amazing springtime treat. In this article I will talk about foraging for fiddleheads, how to identify the correct fern and then go on to ways to prepare fiddleheads. They are delicious but you do need to know how to properly cook them since improper cooking can cause you to feel quite ill.
Should I take a knife to pick them I asked my mentor? Little did I know how much of a novice that made me out to be. My friend laughed. Fiddleheads snap off easily in your hand. We spent the morning walking up and down along the banks of the river, stooped over, picking fiddleheads. Since my skin burns very easily, even with SPF 100, I was delighted to find that the best fiddlehead ferns are found in the shady spots. After Hurricane Irene we were worried that the fiddlehead patch would have been devistated but were delighted to discover that they recovered quite well. That first day we picked about 10 bags of baby ferns. They were popping up so quickly it seemed we could almost see them growing. Where can you find fiddleheads? Gizmos Pickled Plus sells pickled fiddleheads picked in the wild and will ship anywhere. Fiddleheads can only be found in the spring around mid May. During a two week period we picked 450 pounds of fern tops. Ferns grow in clumps with four to six fern frowns coming up out of each clump. Fiddleheads are the beginning curls that first emerge out of the ground. You can pick them until the curl just snaps off in your hand. When the curl unfurls in your hand they are too mature. Leave that one there to grow into a fern. In fact, be sure to leave two or three in each clump so that the fern clump doesn't die. Finally the fiddleheads are packed into jars and processed. .You can purchase our pickled fiddleheads from Gizmos Pickled Plus. We do a case price that you can mix and match with our jams, jellies, pickles and relishes and we will ship it to you anywhere in the country. It is the head of the Ostrich Fern that is edible. Even though Ostrich Ferns too contain toxins, by getting rid of the brown papery covering and throughly cooking them, fiddleheads are delicious and safe to eat. Be sure to remove the brown papery flakes on the outside of the fiddleheads before cooking. Start by blowing them off in the wind as you rub them. Then use high pressure water to remove more. Finally use your hands to carefully remove the rest. Steam or boil your fiddleheads for 10 minutes before consuming. Raw fiddleheads can cause upset stomachs. Warning: Other kinds of ferns may not kill you but you might wish you were dead. Be sure to boil or steam your fiddleheads before you eat them. We like our fiddleheads sauted with garlic and olive oil. They are delightful added to pasta with Alfredo or Marinara Sauce. Any left over fiddleheads we like to add to our salads and quiches. Pickled fiddleheads hang nicely off the rim a a martini glass making an interesting garnish for a springtime wedding. 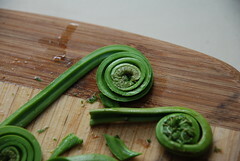 Which is your favorite way to cook and eat fiddleheads? How interesting! My sister lives in East Tennessee so I'll have to look for them the next time I visit in the spring. 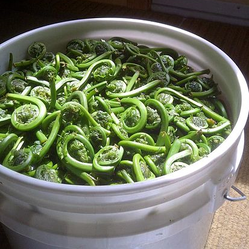 If you would like to try some pickled fiddleheads we offer free samples at Farmers Markets in Central Vermont. We also ship jars of pickled fiddleheads. See the link above to Gizmo's Pickled Plus. Nice introduction to fiddleheads. Had no idea but it's good to know! I would be afraid that I'd pick the wrong plant and poison myself. I'd order from a store, though. Thanks for introducing me to fiddleheads. One of the things I miss about Vermont. Nicely presented, Evelyn. Fiddleheads taste a bit like asparagus. What do they taste like? I've never seen them that I can remember. Great article, Evelyn. I appreciate this page, as I live in NH and would love to try foraging for fiddleheads. But how do you tell the ferns apart to know which ones are okay to eat? And what are the various ways to cook them? Thanks for introducing me to eatable Fiddleheads Ferns, as Mira mentioned I would find it interesting learning how to best prepare and cook them. With people becoming more aware of the benefits of eating healthy, and the push to help support local economies, local farms are reaping the benefits, and so are their customers.